I was confused; I didn’t remember receiving a tweet from him. So I headed over to Twitter, and sure enough, no tweet. I Googled his name, found his Twitter account, and immediately saw the issue: His Twitter account was private, and private Twitter accounts can’t broadcast tweets to anyone who isn’t approved to follow them. Oh, the irony. Here he was, promoting a social network that emphasizes privacy, yet failing to communicate because of a privacy setting he chose. A handful of social networks promise to revolutionize how we interact socially on the web by limiting the number of people in our networks. This, the thinking goes, willincrease privacy and make those online relationships more meaningful. But do they focus on privacy so much that they take too much of the “social” out of social networks? We tried out five such “private” social networks to find out. Diaspora is an open source social networking software that lets you host and run your own social network. There are many installations (called “pods”) of Diaspora currently running, but for the purpose of this article I took a look at JoinDiaspora.com. Joining Diaspora is simple. Once you’ve found a pod you’d like to join, just sign up with your name, email address, and a password, and you can get started sharing. Since many of your friends will likely be on other social networks, you can connect your Twitter, Facebook, and Tumblr accounts to Diaspora. Connecting these accounts does not import your Facebook or Twitter news feed, however, it just lets you update those services from within the Diaspora dashboard. Diaspora provides several ways to invite people to your network. Diaspora’s interface is similar to Facebook’s. The main page features a stream of updates from friends and “creative minds” within the Diaspora community. At the top of a page there’s a little box where you can update your status or add photos to the stream. People can comment on, like, and re-share your updates. Diaspora also allows you to share with smaller groups of people, called Aspects. Aspects are like Facebook Groups: Each has multiple members, which can be visible to all members or just to the Aspect creator. You can choose to share posts with certain Aspects (for example, Family) or with all Aspects, or with the public. Public posts on Diaspora, like on Facebook, are visible to everyone (even people who don’t have the service) via search. Disapora’s goal is a lofty one. It seeks to replace social networks such as Facebook and Twitter. 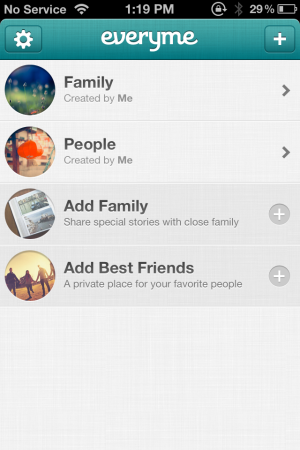 Unfortunately, it doesn’t sport a ton of features compared to the bigger, more established social networks. Though Diaspora does support cross-posting to other social networks, it doesn’t bring in feeds from these social networks so you’ll still be posting to an empty wall unless you have a ton of friends on Diaspora. Diaspora’s main advantage is its open source software, which allows anyone to host and maintain a relatively private social network. For those who are truly concerned about privacy, this means that you can really own all of your data (by hosting it on your own server). But the data that you share with other pods is in the hands of people who are much less experienced in data protection than Facebook and Twitter. Sgrouples is part privacy-advocating social net, part cloud storage, and part project management tool. Sgrouples, whose name was spawned from the term “SuperGroups,” is more of a hub for managing multiple social networks—and files, pictures, and music—than it is a social network. Joining Sgrouples is, perhaps, the most straightforward part of the social network. To sign up, just enter your email address and password on the Sgrouples main page. You’ll then be prompted for more information, including your full name and birthday (though you can always make these up, if you’re concerned about privacy). You can manage many of your normal Facebook tasks through Sgrouples. The main attraction of Sgrouples is its Groups, which can be created for specific sharing purposes. They’re reminiscent of Yahoo Groups—each Group has a name, an optional profile picture, and a category (academic, book club, business, and so on). 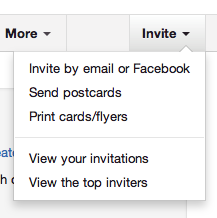 Members can be invited to a group by email address, from Facebook, or from other already-created Sgrouples Groups. Members have different permission levels, including contributor, viewer, limited, or custom. Each Group has a news feed that features all of the recent posts and updates to that group in reverse chronological order. Unlike Facebook, there are no “friends” in Sgrouples, though you can personalize your “profile” with a picture and short paragraph. Each Group does receive its own email address (GroupName@sgrouples.com), which anyone can use to email all the members of the group. Sgrouples isn’t just a social network, though. It also features a personal cloud storage system called “My Cloud.” Every post and picture you upload to Sgrouples is saved in your My Cloud folder, and you can also upload documents and other files. Each Sgrouples member gets 4GB of free storage space, and can purchase an additional 46GB (50GB total) for $4.99/month. Sgrouples is more of a social networking hub than a free-standing social network.. You can link Facebook and Twitter accounts to Sgrouples, and share with those services like you would share with any other Group on Sgrouples. However, with no profile pages, friends, or abilities to broadcast your thoughts to the public, Sgrouples is little more than a glorified email list with a cloud storage service tacked on. Sgrouples does value users’ privacy: It even has a “Privacy Bill of Rights” on its homepage. The company also has a “no ad” model (though you can choose to receive ads if you want to), and promises that it’s easy to leave the service and delete everything you’ve uploaded or shared. The Privacy Bill of Rights also says it will never suggest contacts, friends, or “people you might know.” This is interesting, since I see social networks as a way of sharing with people whose email addresses and other contact information I don’t know (and don’t need to know). Mobile-based Path seeks to create a more meaningful social network by limiting its users to 150 friends. When Path opened earlier this year, the limit was just 50 friends. The reason? Studies have shown that the human brain is limited to maintainingmeaningful relationships with about 150 people at a time. 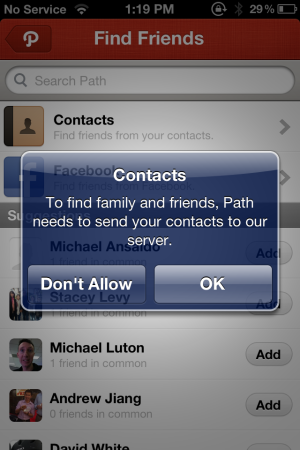 Path invites people to your network via the email addresses in your contacts list. Path is easy to join. It’s a mobile-based social network, but it does have a web app that allows you to edit your profile and general settings (but not see your timeline or friends’ updates) from a web browser. The social network is currently available for iOS and Android, and there’s also an optimized version for the iPad. You can join Path by signing in with Facebook—which makes it easier for Path to pull your existing Facebook friends from the larger social network—or you can sign up with an email address and password. If you sign up with an email address, Path will use your contacts list to help you find friends. Path tries to make the switch from other social networks to its own platform easy by importing not just contact information, but “past moments” from other sites. For example, you can connect with Facebook, Instagram, and Foursquare to import past status updates, photos, and location-based check-ins to Path, so that your timeline, or “path,” doesn’t look so bare. Path is the private social network I found best suited to taking on the public social nets. It’s a real social network, with profiles, friends, and semi-public status updates. It’s easy to move to, thanks to its ability to pull information from other sites. Plus it has a simple, attractive interface that’s easy to use. However, Path does have a couple drawbacks. First, not many people are using Path. While sharing with a close-knit group of 150 friends or less is a nice idea, at the moment there are only two people in my phone book who are using Path: an old high school friend who currently works at Facebook, and a former PCWorld editor. Second, it’s mobile-only. There’s only so much use that you can get out of a social network that requires you to be on your mobile phone to update and check updates. Most of us are tied to a desk for a large portion of the day, and it’s just not very practical to have to constantly check your phone. Like Google+ and Sgrouples, EveryMe does not have profiles or friends, just small, private groups called Circles. Signing up with EveryMe is quick and painless. You supply your name (or an alias), an email address, and a password. Like Path, EveryMe has a large mobile presence. During the signup process the site asks if you would like to download the EveryMe iOS or Android app. But EveryMe’s web app is more fully-featured than Path’s. EveryMe lets you organize members of your network into “circles,” a la Google+. All sharing in EveryMe happens within Circles. Though EveryMe borrowed the “Circle” name from Google+, EveryMe Circles are different than Google+ Circles. Each Circle in EveryMe is a private group of invited members (invited by email, text message, or by searching on EveryMe). The Circle does have a news feed of updated communication between members, but a member of a Circle doesn’t even have to be a member of EveryMe to see them. Instead, whenever someone updates on EveryMe, all the non-EveryMe members of that group receive updates by email or by text, depending on how they were invited. In other words, EveryMe functions a little like GroupMe, a group-texting app that lets you text multiple people at one time (and lets those multiple people text back to the same multiple people). This does sound like it could be a little spammy and annoying, but remember that these groups are supposed to be close-knit, private groups of friends and family who are, supposedly, okay with you constantly sending them updates. EveryMe is a neat little web/mobile app if you’re the type of person who routinely sends out mass emails to friends and family. It’s a great way to share pictures and thoughts with small groups. The email blasts to non-members might help to deter oversharing. I know that if all of my Facebook friends got an email from me every time I updated, I would think twice before updating inane thoughts. Like Sgrouples, there is no real profile or “friending” (though you can search for people by name on EveryMe, and add them to a group even if you don’t know their email address), and all sharing is direct. Nextdoor is an online social network that hopes to connect people with their real-life next-door neighbors. Unlike the other social networks in this round-up, Nextdoor is not easy to join. First, you’ll have to see if there has been a portal set up for your neighborhood. If there has, you’ll have to provide your physical address, since Nextdoor is based on physical location. You’ll also be asked to verify your address. Nextdoor can either send you a postcard with a verification code, or you can verify your address using your credit card (this costs $0.01). Some addresses also allow phone verification. Nextdoor’s news stream shows what’s happening in the neighborhood. Next, you’ll be asked to fill out a profile, which includes questions such as “What do you love about your neighborhood?” and “Where are you from originally?” Then, you can start inviting your neighbors to join—that is, if you know their email addresses or physical addresses. Nextdoor’s home page looks a little like Facebook’s. There’s a news feed, where you can see updates from neighbors and people in your city, as well as a box where you can add your own updates. Updates can include attachments (for example, if you have a flyer for a bake sale) and categories (Buy/Sell/Free, Crime/Safety, Resources, Recommendations). Again, there are no “friends” in Nextdoor, just neighbors who you can group into private groups, allowing you to share updates with just a few people at a time (the parents on your kid’s baseball team, for example). But Nextdoor is mainly for public announcements such as block parties, barbeques, garage sales, and crime watches and not for personal updates. Since it’s for neighbors only, there’s no way to import your contacts from Facebook or Google+, unless they happen to live down the street from you. 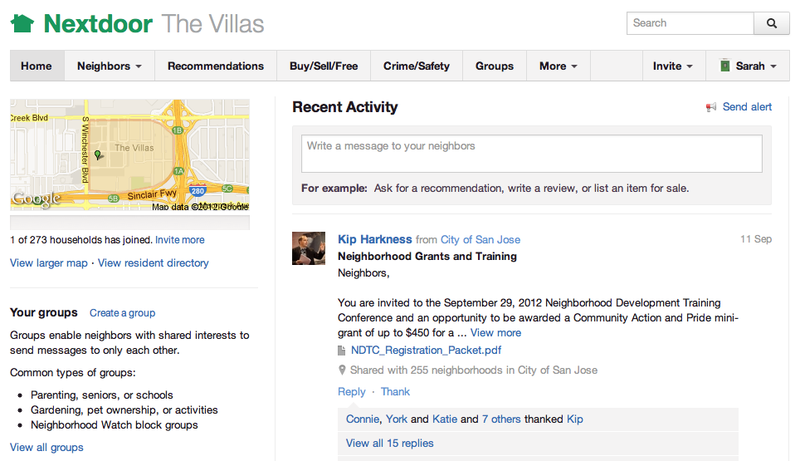 Nextdoor is no substitute for Facebook, Twitter, Google+, or other social networks, and it’s not trying to be. Instead, Nextdoor is trying to get people off of the Internet and out into the neighborhood. Nextdoor has been up and running for a year now, and Nextdoor’s CEO Nirav Tolia says that it has connected more than 5500 neighborhoods across 50 states, and that more than 300,000 messages are traded each day. It’s not quite Facebook, but it’s certainly impressive for such a limited social network.